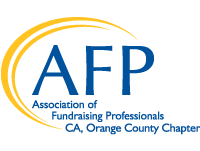 Welcome to the Orange County, California Chapter of the Association of Fundraising Professionals. We welcome anyone interested in learning more about professional fundraising strategies and practices. 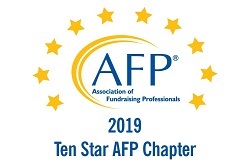 Our 250+ chapter members include Executive Directors, Directors of Development, Consultants, Grant Writers, Fundraising Volunteers and Foundation Executives. To advance fundraising and philanthropy for the greater good through education, training, advocacy and recognition. Our core values are the foundation for achieving the chapter's mission and are made visible by the daily interactions of development professionals. We act ethically, communicate honestly, and behave responsibly to build and maintain the trust of donors and the community. We believe that compassion entails not only the desire to alleviate suffering, but the passion and commitment to become involved and make a difference. We appreciate the generosity of spirit that leads people to make a commitment to work for a better future and improve the quality of life for all. We recognize the importance of creating and maintaining balance in all aspects of life; in finding balance and nurturing ourselves, we can continue to be of service to others.